Stu-DENT Diaries: Win a sleek, compact digital camera!! Haven't I always said that I love giving things away?! 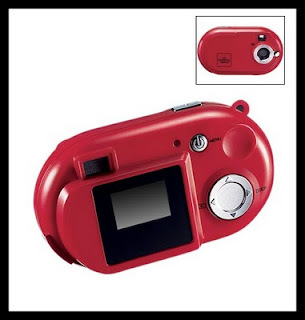 This time around I'm giving away an oh so cute, red digital camera! It has such great features too! 4x digital zoom, maximum photo resolution 3.0MP (2048x1536), built-in 16MB memory, expands to 4GB (or 10,000 photos). 1.1" LCD color display screen, JPEG photo file format. Uses 2AAA batteries (not included). 3 3/4"L x 2 1/4"H x 1 1/8" W.
**Remember, the more entries, the greater your chance to win! Go here for additional details and eligibility rules. winner will be randomly chosen on 09/14/2010 09/30/10. SPREAD THE WORD!